The auditing suite contains all of the tools necessary to ensure compliance with industry standards. Audits managed with the tool can be either internal or external by nature. 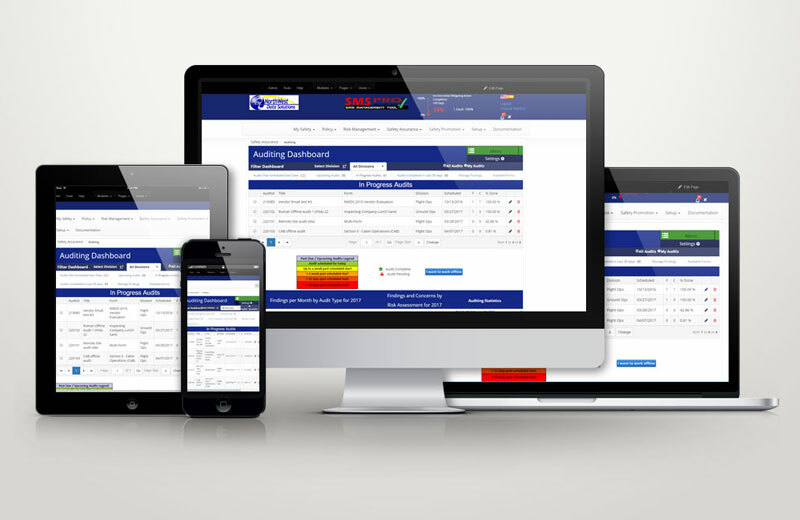 The auditng suite is highly customizable, and can be configured to be used in numerous ways to meet most of your auditing needs. Audits scheduled within the Auditing Suite can be conducted offline, and later synced to the SMS Pro server for further management of the audit and generating reports. 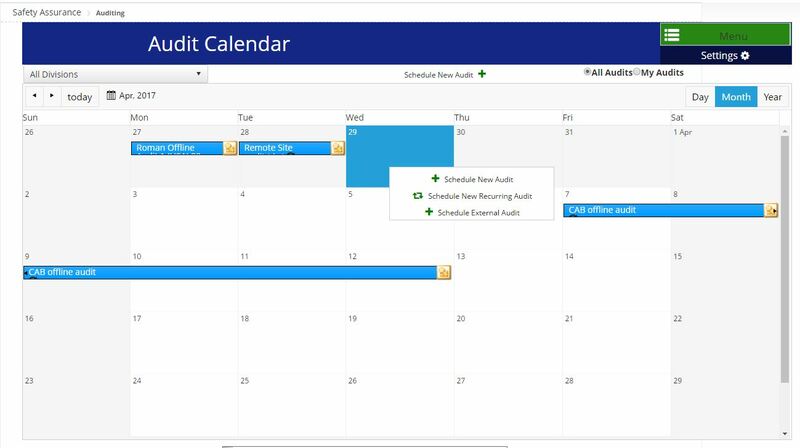 Audting dashboard allows users to view and quickly access upcoming scheduled audits, audits past due, those in progress, and those recently completed. Additionally, a quick menu allows you to access the audit scheduler, calendar, and reporting features. Charting tools allow you to view statistics about your audits such as number started on time and average findings per audit. The Auditing Calendar allows users to quickly view audits that have been scheduled, as well as view details about those audits. Additionally, managers can schedule audits right from the calendar. The Auditing tool is where the audit is performed. Here a memeber of the auditing team is able to answer the questions from the selected form(s), as well as identify Findigs or Concerns in the audit. Attachments can be added to support the responses of each question. When the audit is complete, team members can notify the assigned manager the audit is complete, allowing the manager to review the audit before accepting it as complete. Upon accepting the audit as complete. Findings (and concerns that were identified to be submitted as issues) will be created as issues to manage in the Issue Manager grouped together by audit. In addition to performing audits within the SMS Pro web application, there is an offline version available. The offline auditing tool allowins you to conduct the audit right from your favorite device, as you are performing the audit, then sync it to your SMS Pro server as you progress through the audit. SMS Pro's auditing tool allows for the option of managing findings in the Auditing Module (as opposed to in the Issue Manager). Here more flexibility is offered, allowing managers to assign findings to different divisions and update the audit's Corrective Action Plan. Auditing reports allow managers to view the company's audit plan, analyze repeat findings, and review issues that have been audited by an external auditor. 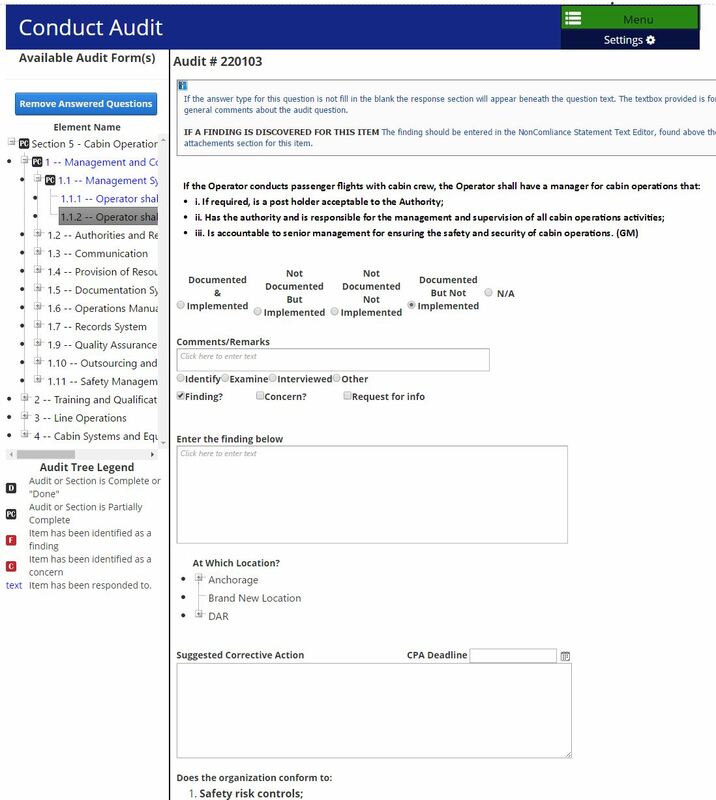 Some of the aviation industry's standard audit forms that are highly complex and would require significant time to input into the system are available as a quick add to your portal. If you require one of these forms or group of forms in your portal, contact SMS Pro tech support.